Abstract: As AI continues to disrupt industry, the need to ensure trust in intelligent systems becomes a priority. To achieve trust, systems have to be engineered from the ground up to comply with ethical and societal standards that vary in different cultures. Governments and the European Commission have recently published guidelines and frameworks for AI ahead of possible regulation of AI. The talk discussed these requirements in the light of current AI technology, both from a business and research perspective and dives deeper into some possible technical solutions at an abstract level. 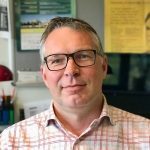 Bio: Dr Bertie Müller is Senior Lecturer in Computer Science in the Computational Foundry at Swansea University. He is also Chairman of the Society for the Study of Artificial Intelligence and Simulation of Behaviour (AISB). Bertie holds a PhD in Computer Science from the University of Hamburg, Germany. Before moving to Wales, he worked in the Computer Science Department at Durham University. Throughout his academic career he has collaborated with industrial partners. His main research interests are in resource and location modelling, multi-agent programming, and intelligent systems. He has over 80 publications, many in highly-acclaimed international journals and conference proceedings. Emphasis in his current work is on ethical design of technology and on making AI working for humanity.